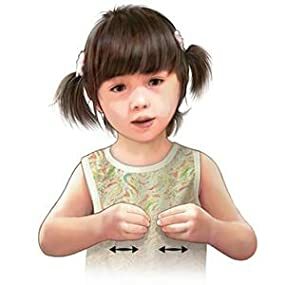 Baby Sign Language Made Easy makes it fun and simple to communicate with your little one long before they are able to talk. From clapping their hands in excitement to lifting their arms to be held, babies are naturally inclined to use gestures to communicate. 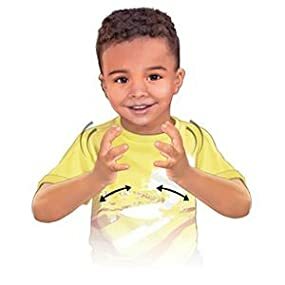 With Baby Sign Language Made Easy youll discover 101 useful, everyday signs such as more, all done, bed, milk that will help you understand what your child is saying while having fun and strengthening your bond. 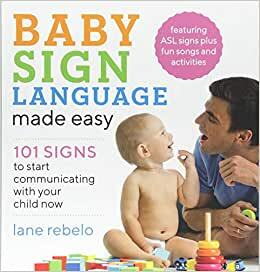 In Baby Sign Language Made Easy Lane Rebelo, founder of the award-winning Tiny Signs® baby sign language program, delivers the step-by-step guidance that has helped thousands of parents integrate baby sign language into their daily routine. 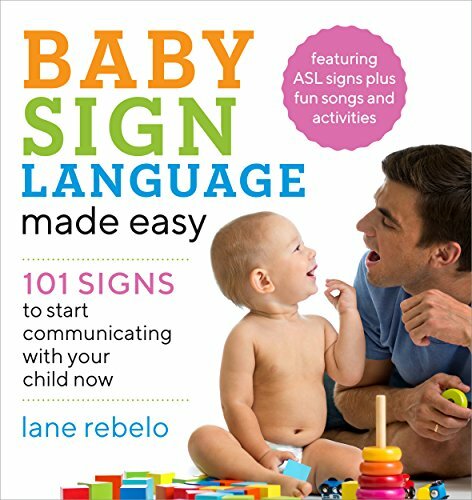 As a busy mother of two, Lane knows that parents dont have much free time on their hands to learn about baby sign language. Here, she offers simple strategies to learn the basics of baby sign language that will help you get started. With Baby Sign Language Made Easy you and your child will quickly learn to communicate about everything that goes on in their little worldand youll have fun doing it. Start reading Baby Sign Language Made Easy on your Kindle in under a minute. LANE REBELO, LCSW, is the founder of Tiny Signs(R), an award-winning baby sign language program providing classes, workshops, and professional trainings in the Boston area and online. Lane is a licensed social worker and worked for many years with families in the Boston area. Lane began studying American Sign Language in 2006 after her first baby was born and was amazed by all she had to say. She lives with her husband and two daughters in MetroWest Boston. You can find her online at TinySigns.net. Bring your fingers and thumbs together on both hands and then tap the tips of your fingers together. Parents often tell me that their babies use the sign for more when they really want something, even after they start talking. As a young toddler, my own little one used to say and sign more for emphasis to let me know she was serious. Memory Tip: It’s like you’re adding things together each time your fingertips touch. When To Use The Sign: More is often used when babies are eating: 'Do You Want More?' This causes some babies to think that More = Food, and they will start to sign More whenever they are hungry. To avoid this confusion, make sure to sign More when you are doing anything your baby enjoys, such as singing, bouncing, or even belly kisses! In time, your baby will start letting you know when she wants More, and not just when it comes to food. What To Look For: Babies might sign More by clapping their hands or banging their fists together. Or they might touch their pointer finger to their opposite palm. Curve your fingers and bring them toward each other a few times in front of your body. You might be surprised at the many ways your baby will use this sign. I have seen babies sign ball to describe everything from ornaments on a christmas tree to a picture of puffed cereal on a cereal box and even pumpkins in a pumpkin patch! Memory Tip: It’s like showing the shape of an invisible ball. When To Use The Sign: Balls are a fun and easy way to engage little ones in play. You can get a plush ball for a younger baby and a bouncy one for an older child. Pass the ball back and forth. Sign Ball while the baby is holding it. You can even do a modified version of the sign for Ball while holding the ball in one hand: Either do half of the sign with your free hand or bring your free hand onto the ball. What To Look For: Babies might sign Ball by knocking their fists together or clapping. My younger daughter signed Ball by touching her closed fist to her opposite open hand. Bring your fingers and thumb together and tap them to your lips a few times. My first daughter signed eat by touching her open hand to her ear. I was new to signing and had no idea she was signing eat. I thought she had an ear infection! One day she touched her ear immediately when I asked her if she wanted to eat and it finally clicked that she was signing. Remember that babies will do their best to copy the signs you show them, but it’s completely normal for their early attempts to be adorably imperfect. Memory Tip: It’s like you’re putting food into your mouth. When To Use The Sign: Eat is a great sign to introduce when your baby starts eating solid food. Sign Eat when you suspect your baby is getting hungry and while he is eating. You can also sign Eat if he is watching you or a pet eating. 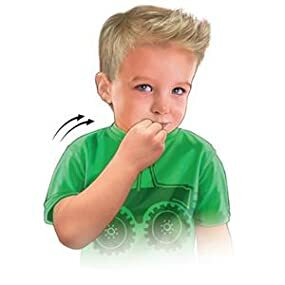 What To Look For: Your baby might sign this by sticking his finger (or even his whole hand) in his mouth. He might also pat his face or head. 5.0 out of 5 starsThis book is written with such loving awareness of infant development. The truth is, I bought this book because I personally know the author. My own children are school-age now, so I figured I'd browse through the book and then give it to a friend who has an infant. But when I saw my 10-year-old poring over the book, practicing signs, and smiling to himself, I couldn't wait to delve deeper into the book myself. And when I did, I realized that I can't possibly regift this book; it's too special to give away! This is the book I wish I'd had when my children were infants. When my first child was born, I was vaguely aware that signing with my baby would be beneficial, and somewhere I picked up a few signs: MILK, MORE, and EAT. My baby took to these signs right away, and they became valuable communication tools for us. I considered teaching my child more signs, but when I glanced at baby sign books in the library, they looked overwhelming and daunting for my sleep-deprived, new-motherhood-addled mind. My child ended up speaking early and well, but I can't help wondering what I missed out on before speech emerged. What would he have communicated to me had I introduced more signs to him? I talked to my baby all the time, but how would he have responded if he'd had the tools to communicate back to me? I'm sure that if someone had handed me this book at that time, I would have glanced through it and been drawn in by its clear illustrations and accessible format. I would have jumped right to the chapter on the first 10 signs and introduced my child to several useful and then playful signs, and even my fatigued brain would have been able to utilize the author's concise memory tips to recall each sign. 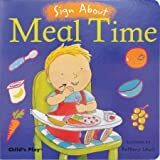 After meeting with success with these signs, I would have gone on to introduce mealtime signs, changing and getting dressed signs, bath and bedtime signs, and animal signs. I would have loved to use the author's suggestions for incorporating signing into books that we happened to already own and songs that we were already singing. 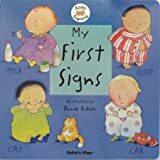 During my more lucid moments of my child's first year, I would have gone back to read the author's introduction and explanation of baby signs, and I would have felt even better about making the decision to incorporate signs into our daily life. This book is written with such loving awareness of infant development. With its anecdotes about the author's own signing experiences with her children, it feels as though a friend is patiently guiding the reader along. No wonder my 10-year-old and I were instantly taken with the book! What we missed 10 years ago, we can now understand together. Didn't realize babies/children learned sign language until our daughter told us our grandson was learning signs in daycare. What really helps is the author's website, where she demonstrates each sign. After reading the book and reviewing all the signs, it was great to see them live. 5.0 out of 5 starsAwesome Surprise! A Video Dictionary is Included! I bought this book to use with my second daughter and I am so happy I did! Lane does a wonderful job of presenting the information in an easy to understand way which was critical for me because I am a busy working mom. I was really happy to see that there's a free online video dictionary too! I didn't realize the book came with that and was really pleased to find a link in the book. It's so helpful to see the author demonstrating the signs to get a better sense of how to do them correctly. The illustrations in the book are great, but seeing the signs in action is super helpful. 5.0 out of 5 starsPerfect For My Lil One. I love this book. It's great all around for a beginner with a baby. My nonverbal 1.5 year old is already signing. And for signs that she can't do yet, she understands when I did them. This book has been a huge help. I ordered this book after only doing a bit of comparison shopping, and I am really happy with it. I have not studied it carefully but just flipped through each page, cover to cover, and I found it to be very concise with helpful images, motion descriptions, and even short mnemonic devices to remember each sign. It is sorted by category (food, bedtime, etc.) which is helpful, so I will plan to focus on one section/topic at a time. Looking forward to studying it more carefully!